This week I made Chicken Parmesan and made a few extra cutlets so I could have an easy leftover meal later in the week. I am always going to make extras, this sandwich was amazing and I only dirtied one pan to make this dinner. I love where there is barely any clean up! I used a baguette for the roll and topped it with some Provolone cheese. Since I am not a fan of Provolone, I had mozzarella cheese in my sandwich. 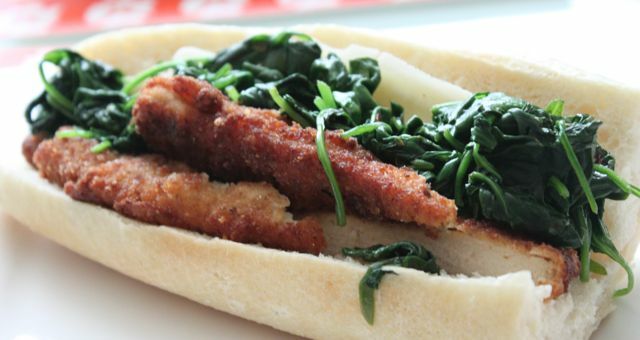 I warmed up the chicken cutlets in the toaster oven and sliced them to fit on the roll. 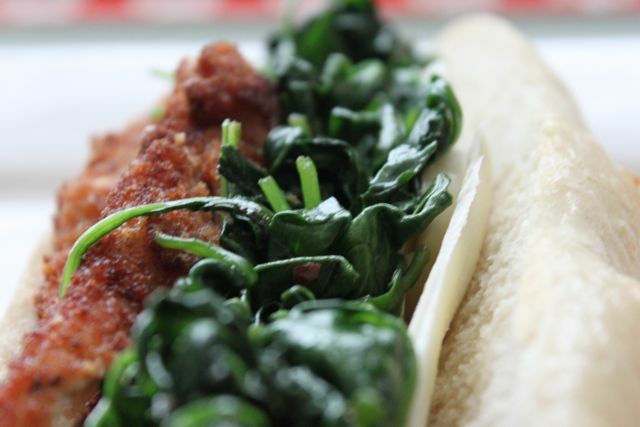 I sauteed some baby spinach in olive oil with garlic and red pepper flakes for the sandwich too. This sandwich was Hubs idea, there is a sandwich shop nearby that makes a similar sandwich with pork. YUM!! i love this kind of leftover meal. sounds delicious! oh yes please, I would eat the whole thing.